Apply for admission to complete the pre-professional year courses at a post-secondary institution. 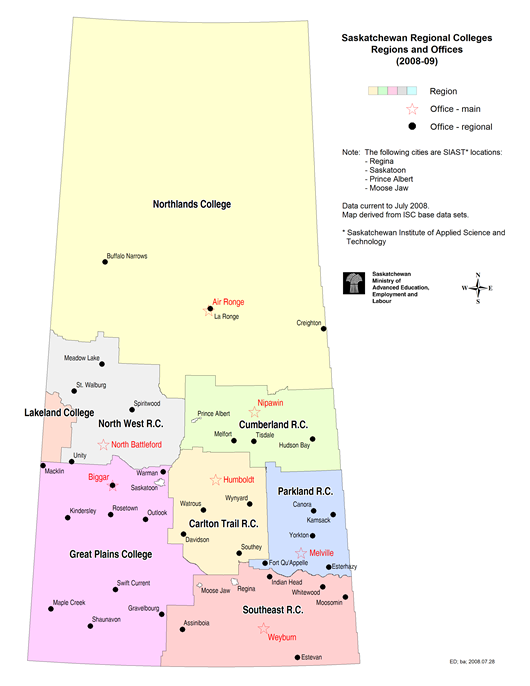 Students applying to Northlands College must be Northerners. The definition of a Northerner is someone who has spent 10 years or half their lifetime residing in the Northlands College area. Students may also take their pre-professional year in other provinces and countries, as long as the courses transfer to the U of S and meet course requirements. If you are attending a post-secondary institution outside of Saskatchewan, see University of Saskatchewan Transfer Equivalents for course equivalency information. While completing the pre-professional course requirements, students apply for admission to the College of Nursing by completing and submitting the online application form. Students may complete years two through four at one of our U of S nursing sites in Saskatoon, Regina, Prince Albert, Yorkton, Ile-a-la-Crosse and La Ronge. The application fee is $90.00. Transcripts from all post-secondary institutions (regardless of whether or not they pertain to nursing), must be mailed directly from the institution to the address below. Please note the applicant cannot submit the transcript(s). Send official transcripts by June 1 for all course work completed from each post-secondary institution (other than the U of S) you have attended. Submit an unofficial transcript or proof of registration for courses being taken between September and April of the year of your desired entrance date. A final transcript must be send when all courses are complete. All students whose first language is not English must present evidence of English proficiency. Learn more about acceptable examinations and minimum requirements that must be attained here. Documentation must be submitted to the address below by June 1. Learn more about acceptable documentation and Aboriginal Ancestry here. Applicants applying for equity seats in this program must submit documentation to the address below by June 1. The University of Saskatchewan provides services and/or accommodations for students with disabilities. All students with disabilities are encouraged to register with Access and Equity Services (AES). Access to most services and programs provided by AES is restricted to students who have registered with the office. If you have a disability you must contact AES. Learn more about requisite skills and abilities necessary to pursue nursing as outlined by the Saskatchewan Registered Nurses’ Association. Applicants who attended a nursing program in Canada or who have completed a minimum of six credit units or equivalent of nursing classes in Canada are required to submit the completed Program Reference Form to the address below by June 1. Students who have previously received a faculty action (required to discontinue (RTD), required to withdraw, advised to discontinue, or academic probation) are required to submit a letter to the Admissions office by the document deadline, June 1. The letter should explain the reason(s) for the faculty action and outline any strategies and supports implemented to promote future success in the Nursing program, if admitted to the College of Nursing. This letter will be reviewed by the Associate or Assistant Dean. Note: Students are not considered for application if they are currently in their RTD period.